Last night, Microsoft held a very brief press event focused on Microsoft Media Center at CEDIA. The focus was certainly on CableCard with SDV capability, relaxed DRM restrictions and removal of the OEM requirement. One thing they didn’t talk about though is something I picked up in the Microsoft Press Release – The new Ceton multi-channel Cable TV Card will get a tech preview this week at CEDIA and it looks like a sure-fire hit for MediaCenter fans. I was curious so I checked in with the Ceton rep and he shared all of the details on the new CableCard tuners – yes there are 3 different versions! Microsoft will be doing a “technology preview” of the Ceton multi-channel CableCard tuner with MediaCenter. This product was first announced at CES earlier this year, but we hadn’t heard much about it since. Now that SDV has been figured out it and the CableCard restrictions have been relaxed this product appears to be coming soon to MediaCenter! The Ceton Multi-Channel Cable TV Card will be the first-of-its-kind solution for enabling advanced cable TV services natively on Media Center (i.e. first multi-tuner CableCard tuner) It supports playing or recording up to 6 HD cable TV channels simultaneously, including premium channels, without the need for any cable set-top boxes. It also enables secure distribution of all TV programming, including live and recorded shows as well as premium and encrypted channels, to additional TV sets in the home via Media Center extenders. 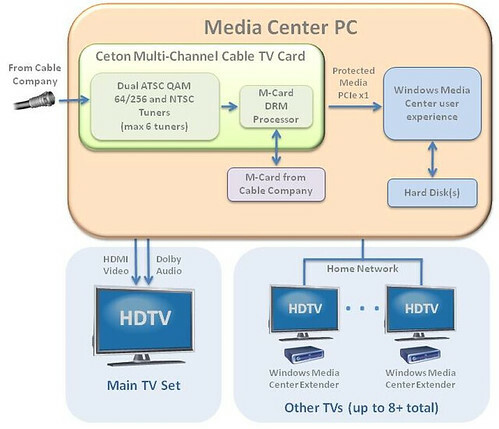 The Ceton Multi-Channel Cable TV Card enables Media Center PCs to play or record up to six live channels of HDTV at once and stream live HD channels or recordings to multiple HDTVs throughout the home, all from a single cable connection. With Ceton you finally have a solution to transform your Media Center PC into a complete entertainment platform for all your media - even encrypted cable TV - with terabytes of storage. Works with any U.S. cable provider. Supports all standard- and high-definition cable channels including premium and encrypted channels. Play and/or record up to six live HD channels simultaneously from centralized storage. Stream live and recorded HD programming securely to several HDTV sets in the home at once. Watch and record from all TVs without needing multiple DVRs or any set-top boxes. 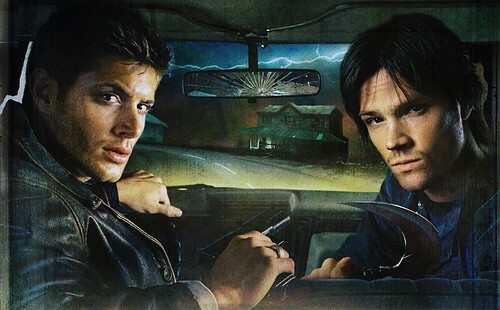 Pause a show in one room and pick it up in another. Supports all Media Center Extenders including the Xbox 360. Eliminate monthly set-top box rental fees — a single Media Center PC can support all the TVs in most homes. The 4-tuner version will be available first, with the 2-tuner version for consumers and the 6-tuner version for pre-configured OEM PC’s available later. The Ceton Multi-Channel CableCard will be available as a standalone retail offering as well as bundled in new PCs from OEM partners Ceton plans to announce in the future. The 6-tuner version will only be available to OEM’s due to the maximum # of tuners limit that Microsoft puts on Windows 7. OEM’s can expand the number of tuners supported in Windows 7 Home Premium or Ultimate to 6 tuners thanks to the AEP (advanced entertainment pack) support added in Windows 7. I’m pretty sure this will be a huge hit for Media Center fans – at least the ones who have access to Cable. Expected pricing wasn’t available yet so that will play into it’s popularity as well. No OEM Bios restrictions for CableCard – so any installer or enthusiast (pretty much anyone) can use CableCard with Media Center. Let’s not kid ourselves, this is an extremely welcome change from Microsoft – one that will make CableCard much nicer for all MediaCenter users. This will be for Windows 7 only. As part of the relaxed DRM mentioned in #2 above, Microsoft and CableLabs are allowing CableCARD customers more portability for content marked as "copy freely" (CF) on other PCs, devices and portable media. Switched Digital will be supported for CableCard via Tuning Adapter – again we heard this one rumored and then confirmed in the past few weeks, but it’s definitely a needed improvement. This should arrive about the time Windows 7 launches on 10/22. According to Andres (reporting from CEDIA), the ATI CableCard firmware update should be available in the next two weeks – before Windows 7 Launches! It will involve a tuning adapter being connected to your PC’s USB port with a coax CATV connection to the adapter. Then the CATV Coax goes from the tuning adapter to the CableCard. All of the above applies to Windows 7 only of course. UPDATE: The relaxed DRM firmware update will be available to Vista users as well as Windows 7 users. All other new items mentioned above are for Windows 7 only. When will the firmware update be available? UPDATE: as mentioned above it looks like it should arrive in the next few weeks. Will CableCard tuners be available at NewEgg, Amazon and other retailers now that the OEM restriction has been lifted? Canada doesn’t get much from these announcements and that’s a bummer. During Cedia, they’ll have a tech preview of the new Multi-Channel Cable TV Card from Ceton Corp., which enables PCs with Windows Media Center to play or record multiple live channels of premium HDTV at once, and stream live HD channels or recordings to multiple TV sets throughout the home, all with a single CableCARD. Read more about this new Ceton Card here. What do you think? Are you excited, disappointed or indifferent? Is Microsoft making the right moves for the MediaCenter platform?